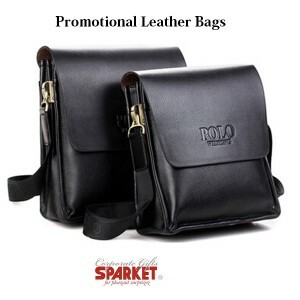 Promotional Leather Bag for Everyday Use! Branded goods cost a bomb for simple reason that they have overheads to sustain and establish their brand over a long period of time. Moreover selling each buyer in single units add to the display and selling cost. The operational cost involved in the whole process results in avoiding buying for a large sales team, employees, partners or business associates due to high tag price. Moreover brands cannot lower their final selling price due to repercussions in the market. Even the brand image gets diluted if the same high perceived product is sold at the lower prices to select few due to large volumes. The better idea is to source it direct from the OEMs or EOUs without the brand tag. This also ensures that your logo can be prominently displayed on each bag. Depending on the quantity the logo can be framed in such a manner that viewer’s will feel that the bag is made by you and is sold in the market as regular available brand. The bag can be designed to suit your purpose with the size, compartments, space for select few items which are required for your daily purpose etc. Depending on the quantity even the leather can be coloured with your house colour to portray your complete brand image. Your logo can be either embossed, or metal or rubber stickers can be implanted to give it a brand feel. The zip can be further customised with your logo to add further glamour to the whole process. The strength of the bag can be decided depending on the purpose and regular items being carried in it. Few industries where you need to carry regular samples the bag can be designed keeping the end purpose in the mind. You can select from the side carrying bag to backpack to shoulder bag to carry bag to suit your usage or gifting purpose. Some industry prefers small pouch size of a toiletry bag or hand pouch large enough to carry A4 size papers or even a full scale file. Now a days you even get a folder bag which can accommodate a tab or smaller laptop to make it easy to be mobile and trendy at the same time. Depending on the purpose you can add a compartment for a pair of clothes to make it an overnighter. Add trolley and it will become even an overnighter to easily move around. You get detachable trolley to make it convenient to leave the trolley at the hotel or car and move around day time similar to a handy bag. If you come across a good bag then may be invest in one and ask us to further improve it with your customised purpose and logo to wow your recipients. You can even start with a trial order and some of the customised accessories can be done later when the bulk quantity is ordered. There is no limitation to a good promotional leather bag once you are clear as to what will impress you, your team and the target audience!